9 years ago this Wednesday was a hot Saturday in July. Rich had taken the train in from Philly to spend the weekend with me. We had planned on going into Valley Stream to get my eyes checked and get some new glasses for me. (It had been about 5 years since my last eye exam.) So we took the train to the local Pearl Vision, only to be told that we should have made an appointment. It would be an hour or more before we could get in. So we decided to spend some time walking around. Green Acres Mall was nearby and we figured the walk would be good for us. Being around lunch time, we decided to head for the Red Lobster that I knew was near by. Unfortunately, what I didn't realize was that it was on the other side of the mall and the heat was getting to me worse than I could have imagined. By the time we got to the restaurant (having walked outside the whole way), I had a minor case of sun poisoning. I ordered lunch, but before it got there, I became so sick that we had to have my lunch boxed up. We still needed to get back to the train station, but I knew that walking back in the heat would only make matters worse. Going through the mall, though, would get us most of the way there in air conditioning. We came in through JC Penny's, only to find out that they were having a jewelry sale going on. We'd been talking about getting married for awhile, so I wanted to look at the rings, give him an idea of something that I wanted. I was hoping to find an aquamarine set in gold that wasn't too big or gaudy looking. Aquamarine is my birthstone and has always been one of my favorites. But the sale had caught the attention of a lot of people, and there was no way that we were going to be seen any time soon. Rather than wait around there, we decided to pass for the moment and finish walking through the mall. As soon as we left Penny's, we were faced with another store - King Richard's Jewlers. Rich and I agreed, later, that it was a sign for that day. We went in, just to look around. I'd had such a hard time finding small aquamarines in gold that I didn't expect to find anything. But sitting in one of the cases was the perfect ring. 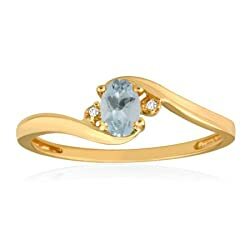 10 karat gold with a small aquamarine, accented by two tiny diamonds. It wouldn't overwhelm my petite fingers. It was the perfect ring for me. And Rich decided that he was going to buy it for me. Not my exact ring, but pretty darn close. "Just don't expect to get it now," he warned me. "I want to find a special time to give it to you." The jewelry store was able to do sizing there, so we only had to wait an hour before we'd be able to pick up the ring. We wandered around the mall for a bit, window shopping at the various stores. I honestly don't remember any of the stores that we looked at that day. I was just so happy to have found a ring that I fell in love with. When the hour was up, we went back into the store. The gentleman behind the counter wanted to make sure that it fit nicely, so Rich slipped it on my finger. I was about ready to slide it back off when he told me, "No. Leave it on." My heart stopped, wondering if it meant what I thought it did. But Rich just paid the gentleman for the ring and took the empty box that it had previously been nested in. Outside the store, he looked at me with a smile on his lips and love in his eyes. "Will you marry me?" I started to cry, throwing my arms around him as I whispered, "Yes." Later he told me that he'd had every intention of holding on to the ring until he could find the perfect romantic moment to ask for my hand. But when he saw it sitting on my finger, he knew that he never wanted to take it off. He knew then and there that this was this perfect moment. So he let me keep my ring on. I don't wear it any more. A combination of one of the prongs breaking, thereby releasing the stone, and the fact that I've gained quite a bit of weight since that day 9 years ago have made it impossible for me to do so. But I have the ring and I have the stone. And someday, I'l going to get it repaired. Because it was my perfect ring from a perfect day.